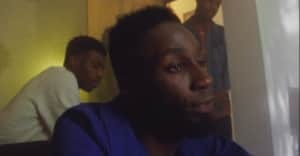 Fresh from supporting Mercury Prize-winning U.K. hip-hop trio Young Fathers on tour, spoken word poet Kojey Radical is back with a searing track dealing head-on with divisions of race and class. With shadowy production from London artist New Machine providing the backdrop to his heart-clenching drawl, on "Open Hand" Kojey speaks on the statuses and stigma that separate us, and how the only way toward change is open-handed acceptance—we no longer need to close our fist for the revolution. “I’ve been getting this 'king' status attached to my name a lot recently," Kojey explained in a statement emailed to The FADER. "It’s something I've struggled to accept because I feel as if I’m on the ground with the people. Quite frankly, people are afraid. Speaking your mind instantly attaches a stigma to your intent; because of that, the initial point gets lost while you battle to be perceived in a certain way. I do not care how people perceive me, not even a little bit. I will always speak my truth when I feel it needs to be heard.